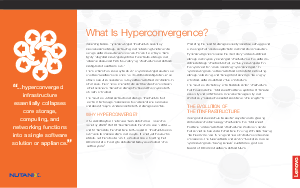 SC Magazine Australia/NZ / White Papers / Lenovo and Intel® / What is Hyperconvergence? Software-defined infrastructure is no longer the future. It is now. In this hyperconvergence overview, we provide a quick overview of what hyperconvergence is and how data center architectures benefit. You will also see some systems, software examples, and recommendations to get you on your way!